With deepest sorrow and remorse, Boston Global Forum (BGF) and Michael Dukakis Institute for Leadership and Innovation (MDI) offers our condolences over the passing of President Tran Dai Quang – President of the Socialist Republic of Vietnam. President Tran Dai Quang was a respected leader, who was very supportive to bring global citizenship education to Vietnam. In 2016, Professor John Quelch, Professor John Savage, Professor Carlos Torres – Members of Board of Thinkers, Boston Global Forum had official meetings at President Tran Dai Quang’s office and received his warm welcome. On December 21, 2016, he welcomed and had an official meeting with Professor Carlos Torres, Chair of UNESCO-UCLA Chair, Global Learning and Global Citizenship Education, and Mr. Nguyen Anh Tuan, Chair of International Adviser Committee of UNESCO-UCLA, Chair of Global Learning and Global Citizenship Education. 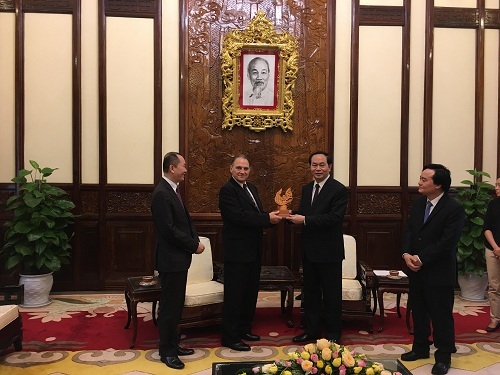 His contribution toward Viet Nam’s Citizenship Education program is particularly notable and will continue to contribute to the well being of Viet Nam for many future generations. Boston Global Forum, as well as Global Citizenship Education Network were deeply touched when President took time from his profound work and duties to support and encourage the members of our organization. His support has encouraged our leadership to continue their work for world peace, security and prosperity. Prof. John Quelch and Prof. John Savage sent condolences and expressed their deep sympathies over the loss of the President.